When Hurricane Odile hit the Baja California peninsula in mid-September, it quickly became one of the most destructive storms ever to make landfall in Mexico. It killed five people, stranded thousands of tourists, and left almost everyone on the peninsula without power. The beautiful, rugged coastline flanking Los Cabos – Baja’s tourist magnets that include the towns of Cabo San Lucas and San Jose del Cabo – still bears Odile’s scars. The cyclone set off mudslides, triggered flooding and damaged over 100,000 utility poles. But electricity is coming back on, roads have been cleared of debris, and planes have started arriving again at the local airport. 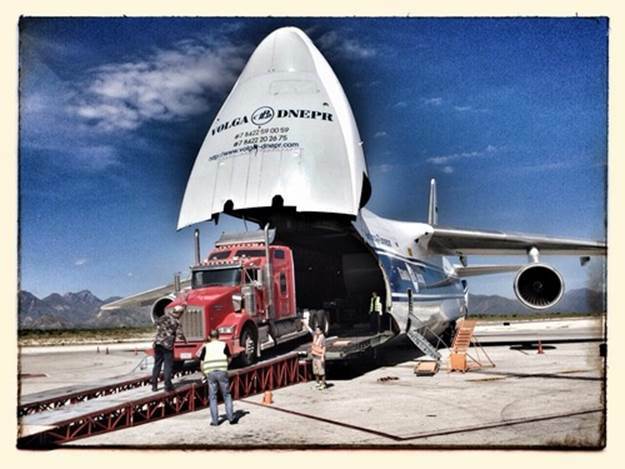 They included one of the world’s largest aircraft, the Antonov An-124. The jet can carry 150 tons of cargo and it recently made four trips to Cabo from Houston, Texas, each time laden with a mobile power plant built by GE. Mexico’s state utility, Comisión Federal de Electricidad (CFE), will use them to pump electricity into the grid and speed up recovery. The swift renewal benefited from some auspicious timing. The storm struck just as Steve Bolze, president and CEO of GE Power & Water, was preparing to leave the U.S. for an energy industry meeting in Mexico City. Instead of going to the capital, Bolze and his team landed in Cabo a week after Odile’s rampage. CFE had previously awarded GE a public contract for emergency power, and Bolze’s team, while they were on the ground, inspected the storm’s damage. They saw that Cabo’s power lifeline, a 100-mile long transmission line starting in the city of La Paz, was too badly damaged to be completely repaired. CFE engineers divided the area supplied by the line into three independent sectors, powering each from aging diesel generators prone to interruptions. GE, which makes a whole arsenal of power-generating machinery, offered CFE a different kind of generator: a mobile turbine built around technology originally developed for jet engines. The turbine, called the TM2500 aeroderivative, is part of GE’s new Distributed Power business. Similar equipment has been used to supply power to Japanese prefectures struck by the 2011 earthquake, and in the desert in Algeria. The turbine sits on a flatbed truck and can reach full power in just 10 minutes. It can generate electricity by either burning natural gas or diesel, depending on what type of fuel is available. The four turbines bought by CFE can produce about 100 megawatts of electricity. “After the purchase contract was signed we deployed a dedicated team to work with CFE to install the turbines,” explains Gerardo Villavicencio, a director in Mexico with GE’s Distributed Power business.